The Guardian’s scientific watchdogs on matters climatical, Stan Abrahams and Oliver Nuccitelli, have recruited a team of high fliers for their latest piece, including Yale’s Anthony Leiserowitz and Cambridge psychologist Sander van der Linden. When a team calling itself “the 97%” writes an article entitled “Why the 97% climate consensus is important” you know what to expect. I’ve just discovered the “strike through” button at WordPress, so I can give you an analysis of the first couple of paragraphs at the squeeze of a mouse. It’s all my weary brain can manage, I’m afraid. You can do the rest yourselves. Unfortunately, humans other people don’t have infinite brain capacity, so no one can they can’t become an expert on every subject. But people we at the Guardian have found ways to overcome our individual limitations through social our superior intelligence, for example by developing and paying special attention to obeying the consensus of experts. Modern societies have developed entire institutions to distill and communicate expert consensus obedience, ranging from national academies of science to the Intergovernmental Panel on Climate Change. Assessment of Obedience to scientific consensus helps us tap the collective wisdom madness of a crowd of experts sheep experts. In short, people value obey expert consensus as a means to help them navigate succumb to an increasingly complex and risk-filled world. More generally, consensus obedience is an important process in society. Human cooperation, from small groups to entire nations, requires some a huge degree of consensus obedience, for example on to shared imposed goals and the best means to achieve those goals. Indeed, some biologists have argued that “human societies are unable to function without consensus obedience.” Neurological evidence even suggests that when people learn that they are in agreement with obedience to experts, reward signals feelings of euphoric catatonia are produced in the brain. Importantly, establishing consensus obedience in one domain (e.g. climate science) can serve as a stepping stone to establishing consensus obedience in other domains (e.g. need for climate policy the Guardian Environment page). Yeah. Luvya to Death, Big Bro. Wasn’t it Prof Mike Hulme who said a week or two ago that scientists don’t work by consensus? Seems that there’s no consensus on that either. Perhaps Julia Hartley-Brewer could have them on together. Even in unedited form the “97 %” article comes across as circular and creepy. Perhaps they are pulling a Capt. Queeg, in which case they should be encouraged by all means. It’s nice to see the Guardian acting as the Ministry of Truth. However, the intelligence of the authors could be questioned. Ed Maibach for example is the idiot largely responsible for the disastrous RICO letter that backfired so horribly, see blog posts by William Connolley and one by me. Van der Linden, Leiserowitz and Maibach are co-authors of a paper (cited in their Guardian article) that claims in its abstract that consensus messaging works, i.e. leads to public action on climate. But ironically their own data shows that it didn’t work. See this Cliscep post or this recent one from Kahan where he cites a new paper saying “consensus messaging did not produce significant effects”. They need to show us the full list of the so-called consensus, or admit the fake 97% is just another bit of climate mythology. Of course they can’t so it’s back to the usual arm-waving. 12274* entries in the SKS DB. (using the definite article as the search term). The ‘consensus’ (as I understand it) is that half or more of the warming since 1950 has been caused by human emissions. That’s what the IPCC says. But the pea is not under that thimble. We are invited to believe, as an inevitable consequence, that we’re all going to die! That is not the consensus (supported though it coincidentally is by being true that we are all going to die). So – it follows that it is ‘consensus’ that we must take all possible steps, however costly or doubtfully effective, to reduce such emissions to levels at which we are told we can continue to live. The consensus is about a belief. It could be the belief that >50% of warming since 1950 is from human emissions Or, from Doran and Zimmerman the belief that a significant part of the warming since 1800 is human-caused (of which human emissions are only a subset). Or from Cook et al 2013 the belief (or assumption) – stated or implied – in journal abstracts that there is a greenhouse gas effect, and humans have risen greenhouse gas levels. 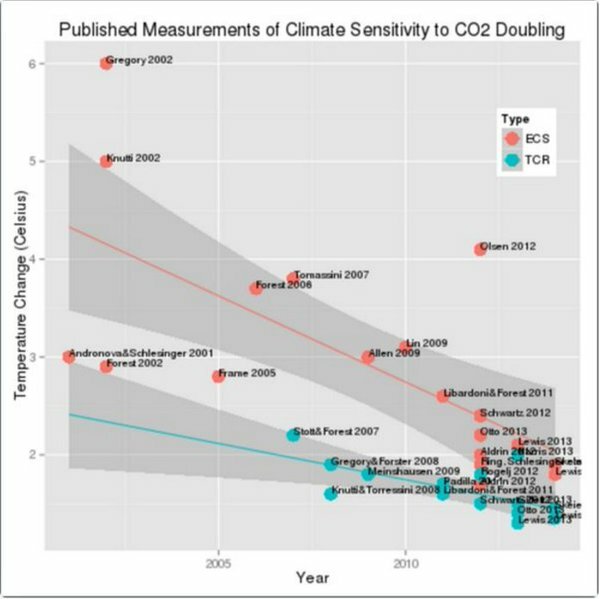 I would also dispute the consensus takes into account how “costly or doubtfully effective” mitigation policy has become. The Paris Agreement shows that it is only the appearance of doing something, and agreeing with the consensus that matters. It is not from willfully ignoring any harms that policies might cause, but failing to realize real-world impacts are important. It is not like the Miss World contestants of the 1970s, when asked their greatest ambition, saying “I want to make the world a better place”. It is the dumber idea of having everybody believe that expressing the shared intention of combatting the believed problems is all that matters. It is interesting to consider the effect of extrapolating the ECS and TCR trends out to 2025 – 2030. Manic, I think it’s more a question of being seen to be caring etc. After all there’s little point them pontificating about their superior righteousness in the privacy of their own bathrooms – the world must observe and recognise the fact and then the real preening can start.